This is the sort of thing I did when I first started painting small still life studies. Before I started buying panels, I was cutting up small peices of pre-primed canvas and taping them to a larger peice of plywood. I threw most of them away. I think that's a great, cheap way to paint when you're starting out and/or just want to experiment without feeling the weight of expensive materials and the fear of failure that comes along with it. I think you are a painter and teacher par excellence! I love the idea of painting on disposable surfaces to keep one "honest". I have a teaching background and was wondering if you would consider doing a teaching oriented workshop for prospective teachers. Of course, if I make it to Austin to visit my stepdaughter, I will have to sign up for one of your workshops there anyway! It looks so simple and yet so elegant. This is just beautiful. 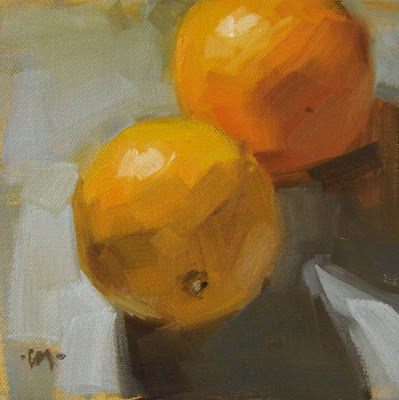 I love the individual color strokes in the oranges, they are so effective in showing me the orange-ness as well as the bulk. And the background and shadows are just stunning too. But this one is done on a panel, right? Thanks you guys! This painting is recent and done on panel, yes. This is another great one. No surprise of course! Love it! your work is an absolute inspiration for me! This blog is a great place to stop by any time. But here's the thing. If you do a painting on primed unstretched canvas, it is so easy to put into an inexpensive premade frame. And even easier to mail it to the buyer. Again. The brushwork is just stunning. The softness of the strokes and the beautiful neutrals. Love it! I'm glad to hear that you had a number of 'throw-aways' a while back. I am trying to change to painting quickly, having painted meticulously, layer on layer in the past. It is hard - and sometimes discouraging. The best thing that I know is that persistence will win out in the long run.